Welcome to the Rancho Bernardo High School Vocal Music Department! The Award-Winning RBHS Choirs are directed by Lisa Friedrichs and consist of four groups. These ensembles perform throughout the community at San Diego Padres baseball games, San Diego Chargers football games, local fairs, corporate events, holiday parties, concerts, and more as well as compete at both the regional and national levels in festivals across the country. To train students in the fine art of vocal musicianship as individuals and within an ensemble. To expose students to a variety of vocal music genres including a capella, pop, gospel, modern, show tunes, and more. To teach dedication, persistence, collaboration, cooperation, and build confidence. To instill a love for vocal music and performance that fosters lifelong appreciation for the arts. 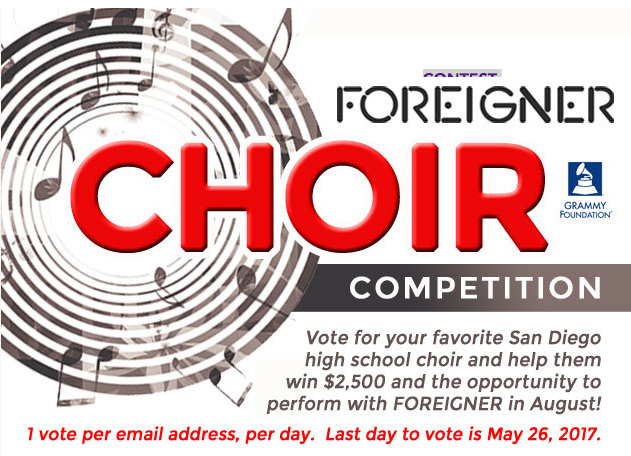 Madrigals have entered the Foreigner High School Choir Competition. Please help us win by voting. You can cast a vote once per day per email address. Click on the image to the left to be taken to the competition page, then scroll through to find RBHS and click VOTE. We can't thank you enough for your support! Please share this with your friends and family too! As we head back to school there are quite a few events coming up. Please make sure you keep up to date by checking the calendar for the latest information. RBHS Madrigals and Advanced Women's Ensemble are available to perform and entertain your guests at your company event or holiday party. For more information and to reserve your date click on the button below. With budget and funding cuts to performing arts organizations throughout the country, our programs are in constant need of your help and support. Even a little bit can make a huge difference. Your students sincerely appreciate it!